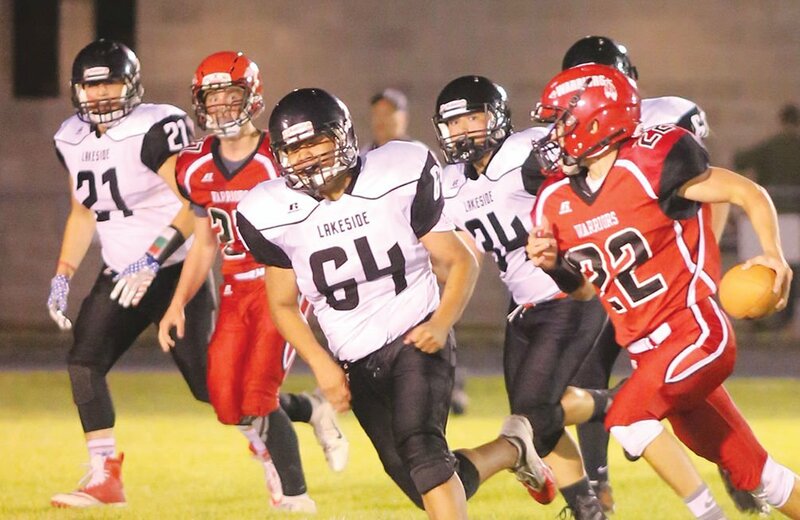 Lazarus Iron Cloud steps up in the pocket for Lakeside Sept. 21 in a NSL game at Kootenai. Trey Wienclae #21, Talon Twoteeth #64 and Vincent Howard #34 cut off Kootenai's Gage Maitland in North Star League action Sept. 21. Triston Usdrowski leans forward for a touchdown pass Sept. 21 on homecoming. Kootenai defeated Lakeside 58-6. 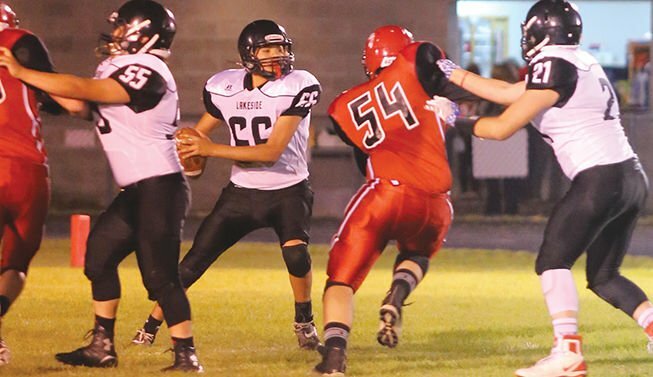 Lakeside's Devin Arroyo lines up on offense during a Sept. 21 matchup at Kootenai. Lazarus Iron Cloud darts through Kootenai's defensive front Sept. 21 in North Star football action. J.J. Hall works in the backfield for Lakeside Sept. 21 at Kootenai. Jaemen Harold prepares to kick off. Christopher Enick takes a handoff and darts out of the pocket Sept. 15 at St. Maries. Hunter Gamble runs the ball for St. Maries Sept. 15 in CMAFL football action. Kody Tefft prepares to hand the ball off. Jemari Peone breaks a tackle Sept. 15 at the Warriors visited St. Maries. Hallah Peone and Marcus Lowley wait for instruction as the Warriors look to move the ball upfield. Jayden Pluff gets up to the line of scrimmage. Jack Barta and Logan Darnold wait for the ball to be snapped Sept. 15. Kody Tefft powers forward for a touchdown Sept. 15 in Chief Morris Antelope Football League action with the Coeur d'Alene Tribal Warriors. Xavier Sloper cuts off a Warrior runner Sept. 15 in SMAFL action at St. Maries. Members of the St. MAries Middle School football team include (front, from left) Kyler Jackson, Alexzander Lambson, Truman Milikin, Jeremiah Frank, Tyler Renner, Tyler Harvey, Gavin Hodge-Wemhoff, Jaden High, Roan Ford, Tristun Hill, Dolton Ustick and Aiden Miller. (back) Trey Gibson, Coach Aaron Cloud, Brock Anderson, Noah Morris, Cole Darnold, Garrett Shoesmith, Trace Wicks, Jordon Corne, Jared Badgett, Dillon Holder, Trey Emery, Karson Thorhaug, Coach Todd Bittermam, Ethan Kolar, Landon Warren, Milo Marsh and Carter Moore. Coy Sands took this punt return to the house Sept. 28 as the Lumberjacks defeated Bonners Ferry 53-0. Aubree Osier kicks one of her five extra points for St. Maries Sept. 28 against Bonners Ferry. Aubree went 5-8 for the Lumberjacks in their 53-0 win. Tyson Gauthier rumbles forward Sept. 28 in non-league action with Bonners Ferry. Aubree Osier watches one of her five extra points sail through Sept. 28. Shaun Anderson takes a hand off Sept. 28 in non-league action with Bonners Ferry. Aubree Osier stands on St. Maries' sideline Sept. 28 in non-league action against Bonners Ferry.